JAXA Astronaut Kimiya Yui, NASA Astronaut (and Neemo 16 Commander) Dottie Metcalf-Lindenburger, ESA Astronaut Tim Peake, and Veteran Aquanaut Dr. Steve Squyres. 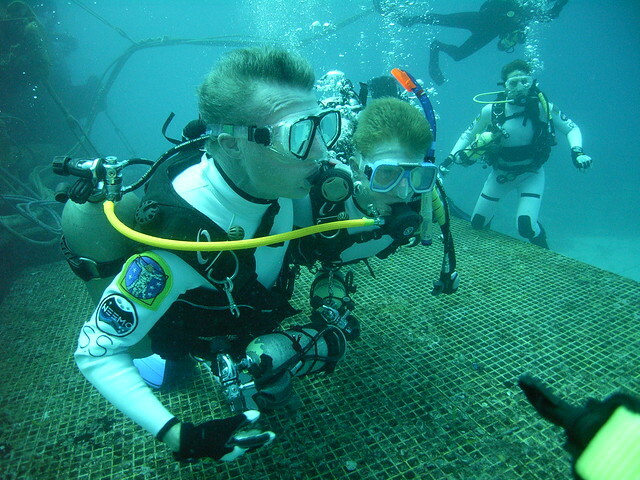 After months of training and preparation the day finally arrived… Splashdown for NASA’s NEEMO 16 mission. The crew woke early, eager to pack the few last remaining items into the ‘pots’ that our superb support crew, amongst their many other tasks, would be taking down to the Aquarius habitat ahead of our arrival. The atmosphere on the Key Largo dockside this morning was buzzing with activity, conversation and good humour. The NEEMO mission team had gathered to say farewell to the saturation crew – and despite our intense excitement at what lay ahead we were genuinely sorry to say goodbye to all our friends and colleagues who have dedicate so much time and effort into making this a successful mission so far. The weather today was kind, as it had been all week, and with only a 2-3 foot swell to deal with, our dive boat made quick work of the 8km out to Life Support Buoy, which feeds Aquarius with electricity and clean air. It felt quite weird — donning SCUBA gear for what could have been a routine dive but knowing that we would not be surfacing for 12 more days! With our team photo complete and the hot Florida sun beating down on us — finally jumping into the ocean was just the best feeling ever. Since we had full cylinders of air on our backs the team enjoyed a great dive around Aquarius, which included of course posing for the customary pre-mission photos! As we positioned ourselves around one of Aquarius’ port holes we were joined by an inquisitive little turtle, who we later learned was called Little Joe and was a huge fan with previous NEEMO crews. With the air getting low it was finally time to say goodbye to our topside dive buddies and head into the wet-porch of Aquarius, where our lab technicians James and Justin were waiting to greet us. Some of the first things we noticed were the higher pitch of our voices and the fact that it was very hard to whistle in the thick air under a pressure of 2.5 atmospheres. Aquarius is such an amazing place — unique as it is currently the only underwater habitat in the world and as James took us through the initial briefing it was hard not to be distracted by the Wrasse, Grouper, Barracuda and myriad of other marine animals who were queuing up outside the portholes to look at these strange humans who had come to share their environment for a short period of time. Unfortunately, our free time to enjoy the new environment was limited as we had to get to work setting up our ‘IV Station’ with communications, IT, cameras, etc., and getting back into the water in pairs with our mini-workstations and jet-packs attached for more familiarization and practice of our asteroid extravehicular activity techniques. So a successful and busy start to this amazing mission, and as we acclimatise to our new surroundings, it is very clear to see that the real fun is only just beginning! It was pretty fantastic to see you all against an amazing backdrop of active marine life – I think they chose the perfect location for an underwater habitat! How did you feel physically in the first few hours down there? I’m curious to know what pressure effects were physically noticeable.